Receive complimentary lifetime digital access to the eBook with new print purchase. This convenient selection of federal taxation statutes and regulations is designed to provide up-to-date information, through May 2018, for students and professors alike. It includes edited provisions of the Internal Revenue Code (IRC), Treasury regulations, and various materials prepared by the Internal Revenue Service (IRS). 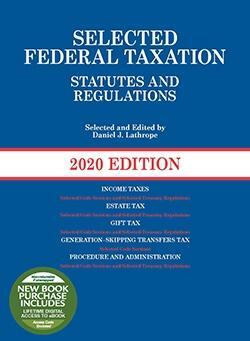 A staple text in law schools, this informed volume is relied upon for its consistent format and extensive coverage. Detailed sections on the Internal Revenue title and Treasury regulations discuss income taxes, estate and gift taxes, employment taxes, miscellaneous excise taxes, procedure and administration, and the generation-skipping transfer tax. Detailed appendixes and a topical index are also included. The new volume contains all relevant statutory changes made since 2017, including the changes made by the Tax Cuts and Jobs Act (Pub. L. No. 115-97), the Bipartisan Budget Act of 2018 (Pub. L. No. 115-123), and the Consolidated Appropriations Act of 2018 (Pub. L. No. 115-141). IRS regulations are updated and the inflation-adjusted items for 2018 are included (Revenue Procedure 2018-18, Revenue Procedure 2017-58, Notice 2018-03, and Notice 2017-64). BarristerBooks.com is the Internet's largest independent legal bookstore, offering over 3,000 legal titles to attorneys, paralegals, pre-law and law students, and the general public. We offer law titles covering over 150 legal areas, from Admiralty Law to Zoning Law, and everything in between. We have been serving our customers with superior customer service since 1999. Unless otherwise noted, all items sold by are in brand-new,unused condition, direct from the publisher. Orders generally ship within 1-2 business days. Free and Standard Shipping ship via USPS Media Mail (6-10 day delivery timeframe), Expedited Shipping (2-4 business day delivery timeframe) ships either UPS Ground or USPS Priority Mail.